Peaches and Paprika: We're so high we could fly! We decided to don new hats and do a new New Year's Card to welcome in 2016. We went to a lot of trouble, clmbing on this bottle of champagne and trying not to get hit by a flying cork so that our owner could do her "photo thing! Happy New Year's for real to our our blogger friends from this year! 2015 was our first blogging year and it is heartwarming to get to know such a fun and warm-hearted group of people! May 2016 bring you at least one of your wishes. Hey Peaches and Paprika and Fambly! Happy Mew Year! Hope your Next year of blogging am furry goods! Dodge the cork, ignore the drunk Mom, and do some happy-dance. A Happy 2016 to you all! Thank you, KFM, Happy NY to youze too! Happy and Healthy New Year to all of you too. Great New Years card. Have a great day. 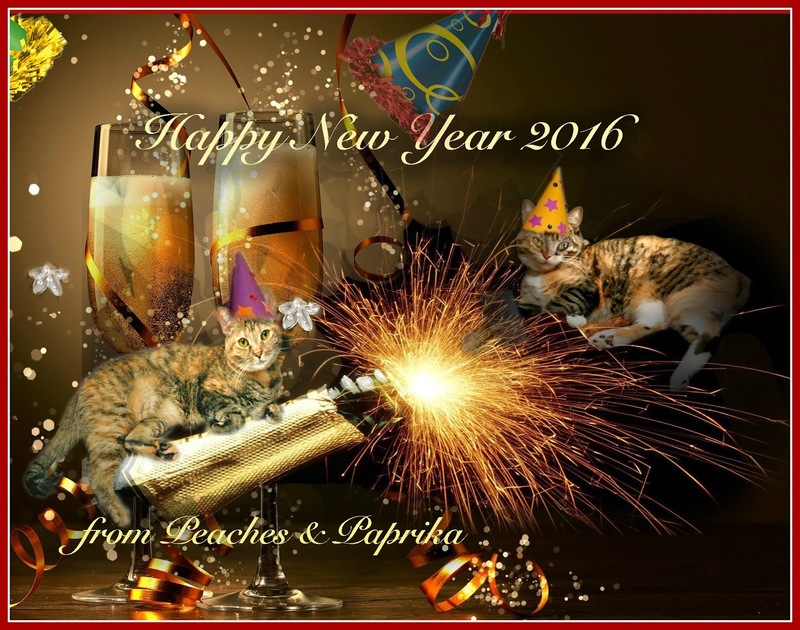 Wishing you a very very happy New Year, Peaches, Paprika, and family! And I love your New Year card! Happy New Year to you and your mum! That is a pretty card, and of course it is lovelier for you being on it. We love your card. You are so good with Photoshop. We've had photoshop Elements10 for 3 years and barely know how to use it. It's very complicated - to us anyway. Happy New Year friends, May you have a healthy and happy 2016. I love your graphic -- very pretty and festive. Happy New Year and look forward to seeing lots more of you. Happy New Year to you too! Congrats on finishing your first year of blogging, here's to 2016!